On this page I’ll be putting a link for each coding challenge tutorial as they become available. If you have not yet done the setup required to use scriptcraft, follow the steps below under the GETTING STARTED WITH SCRIPTCRAFT heading – those steps will guide you through getting setup so you are ready to start coding. Once you have everything setup, you can start trying out the different code-challenges as they become available. You may already have Java installed on your computer. However, unless you already have Java JDK 8 installed, you should uninstall whatever java you do have, and install Java JDK 8 – this is the Java version that will work best for ScriptCraft. To know what version of Java you have, follow the instructions here. If you already have Minecraft Java Edition, just make sure you’re running the latest version (v1.12.2 at the time I wrote this), and you’re good! NOTE: The Windows 10 version of Minecraft is not what we want, only use the Java Edition of Minecraft. SpigotMC is a version of the Minecraft server which makes it easy to create and use your own server plugins & mods. This step may take a little while to complete, several things need to get downloaded & built, but thankfully it is all done auto-magically for you. Download the ScriptCraft plugin, and save it to the plugins folder. 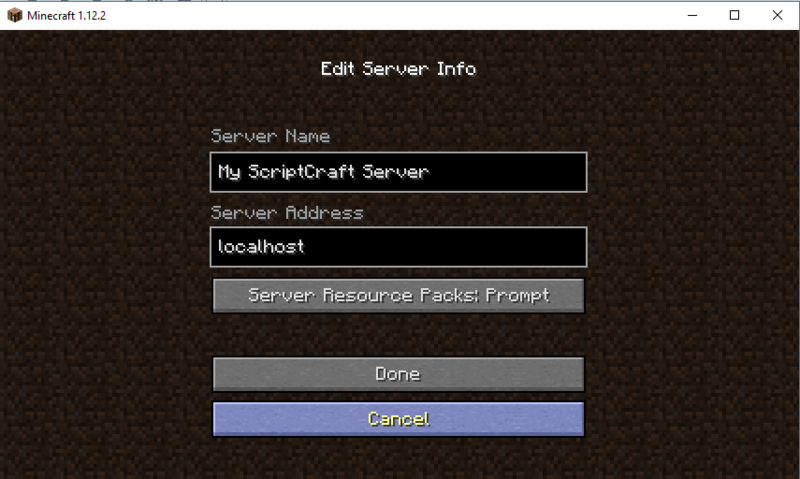 Now that the SpigotMC server is installed, you’ll find you have a ‘plugins’ folder – this is where you’ll need to place the ScriptCraft plugin once you’ve downloaded it. The link above is a direct link to the latest version of the ScriptCraft plugin. However, if the link does not work because the address has changed, you can always visit this page to get the latest version. Launch the SpigotMC server, just as you did at the end of Step 3. Launch your Minecraft Java Edition client. If it fails to connect at first, just relaunch one more time and you should be OK.